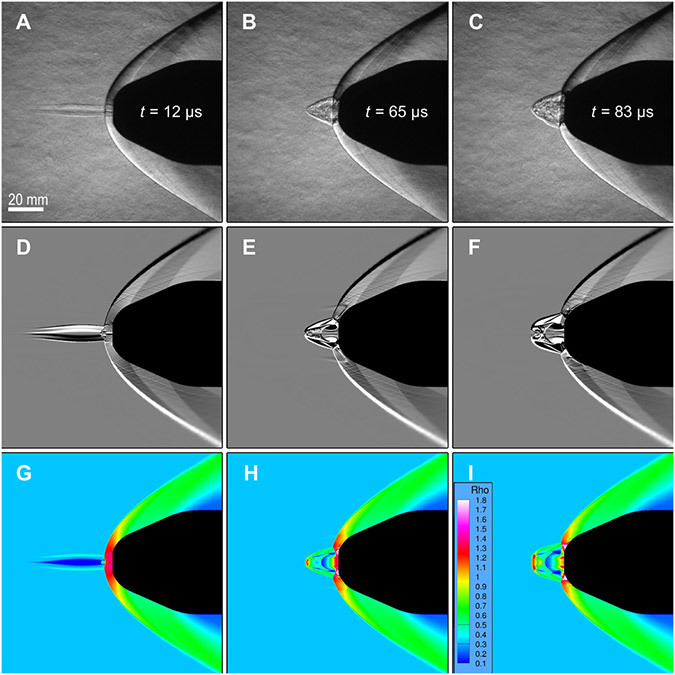 Penelitian - Researchers showed experimentally that an embarked terawatt femtosecond laser can significantly decrease this drag. Paul Quentin Elias of the Université Paris Saclay and colleagues measured a 50% transient reduction of drag on a test model placed in a supersonic wind tunnel. When a body moves in the atmosphere with a velocity exceeding the sound velocity, a shock wave is generated. This leads to a considerable increase in the drag experienced by the supersonic object towing the shock wave. This shock wave increases fuel consumption and produces a sonic boom that renders regular supersonic flight above populated area unacceptable. A common strategy to mitigate these nefarious effects is to give a long and slender shape to the body in the form of a spike. This results in a gradual deviation of the flow with a weaker oblique shock and sonic boom. However, there are limits imposed on the aspect ratio of the spike, either because of structural constraints (vibrations and mechanical stress) or constraints related to maneuverability. Several authors have suggested that an immaterial spike in the form of a long plasma column would help circumvent these limits. The plasma filaments formed by ultrashort laser pulses are particularly attractive for this purpose because of their ability to produce linear energy deposition over distances ranging from centimeters to meters. Even the small disturbance created by a weightless laser-induced spike should lead to a substantial improvement of the drag coefficient of the flying object without affecting otherwise its flying performances. It could also be used to provide a steering mechanism with no moving mechanical parts. Saclay and team have successfully reduced by half the instantaneous drag experienced by a test model placed in a Mach 3 supersonic wind tunnel. This is achieved by an intense ultrashort infrared laser pulse emerging from the front of the model.